The banquet--held each spring--is QLaw's signature annual event. It's an opportunity for QLaw members across the state to convene to network, learn what the organization has accomplished in the year prior, and learn about opportunities to serve marginalized communities and to champion equality in the year ahead. 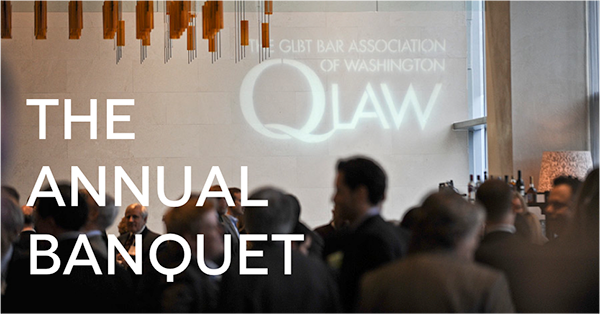 It's also an opportunity for QLaw to connect with the legal and business community at large to showcase how their commitment and sponsorship of QLaw helps effect change in the lives of Washington's LGBT citizens and families. Each year this event attracts luminaries in the legal field, Washington state politicians, and notable leaders fighting for equality on a national level. We invite you and your organization to sponsor and attend this event. Sponsorship and ticket information is available between January and the event in April. And if it's between April and the end of the year, we'd still love to hear from you. Email [email protected] for more information and future sponsorship opportunities.